I’m a huge fan of zombie fiction. A lot of people don’t understand that good zombie movies are about people, not about zombies. Maggie is Henry Hobson’s take on the genre. 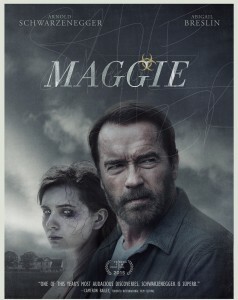 It stars Abigail Breslin (Little Miss Sunshine) as the titular Maggie, and Arnold Schwarzenegger as her dad, Wade. From the start Maggie has been bitten. The doctors give her a couple of weeks during which she will succumb to the infection. After that her dad is supposed to take her to quarantine or put her down. Essentially through the film she’s slowly dying and her family are coming to terms with losing her. This is the first time I’ve really seen so much focus on the “turning” phase. Typically zombie fiction focuses on survival and human relationships in a post-apocalyptic world. People still “turn” but it’s usually a much quicker process (anywhere from a couple of minutes to a couple of days). People grieve and then do what they need to do. Maggie stretches that unpleasant two hour process out and makes you deal with it for two weeks. Sadly, it feels exactly like that… a short event that is stretched on far too long. The movie isn’t even really that long. From the first frame of actual movie to the start of the end credits is only 87 minutes. Thats just north of the bare minimum required to be considered a feature film. The concept is not bad either. It’s more an issue with the execution. Arnold actually does a good job. The problems are that there isn’t much dialogue for him or any other character, and their actions seem to be limited to random walking, or staring blankly into the distance looking sad and thoughtful. The pacing is also really slow. The soundtrack is decent. Atmosphere is appropriate although it appears to be thundering indefinitely. I can let that slide. The frame composition and visuals are beautiful in a dark way. Eveything is present except relationships. They don’t act like family at all. The conversations feel awkward. The very first interaction that the stepmom has with the dying Maggie is asking her to help with the dishes. The old three minute Dead Island game trailer from 2011 was more moving than these performances. One thing that really irritated me is the doctor. He gives Wade three options to deal with Maggie’s failing health and option 2 seems so lame. As if potentially having to kill a loved one wasn’t hard enough, they tack on this extra layer that felt totally unnecessary and cheap. If you are a true zombie fan then it might be worth renting. Otherwise I can’t really recommend it.